Another apple recipe. Are you surprised? Promise I’ve got some other things prepared for you! I wasn’t sure what to call these. I’m still not sure, but I really want to share them with you, so Apple Pie Bites it is! This idea just sort of hit me one day. 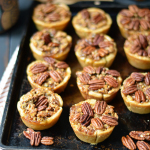 I’ve made tiny bite-sized apple pies in a mini muffin pan before, but I wanted to do something different with these. 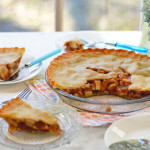 Most apple pies call for chopped or sliced apples, which I found difficult to fill mini pies because they were so…mini. We’ve been doing a lot of cleaning and reorganizing in this house recently because I acquired so.much.stuff. when I lived in my college apartment. For the last few months, I’ve felt like my room has resembled something from those hoarding tv shows. Except it’s mainly stuffed with clothes, a ridiculous number of shoes, books, baking supplies and props. Not like, trash and small rodents. I’ve been able to stuff some of my kitchen things in my parents’ kitchen, but it didn’t take long for the cabinets to become frustratingly over-filled. I snapped one day and reorganized the cabinet where we keep the flour, sugar, one thousand different kinds of Ziploc bags, some small and ancient packets of tea, and a collection of kitchen utensils that we never really use. In that little tub of kitchen utensils, I found a melon baller. I’ve seen some mini caramel apples made with round apple pieces (that’s where the melon baller comes in), and thought it would be fun to see what else I could make with them! 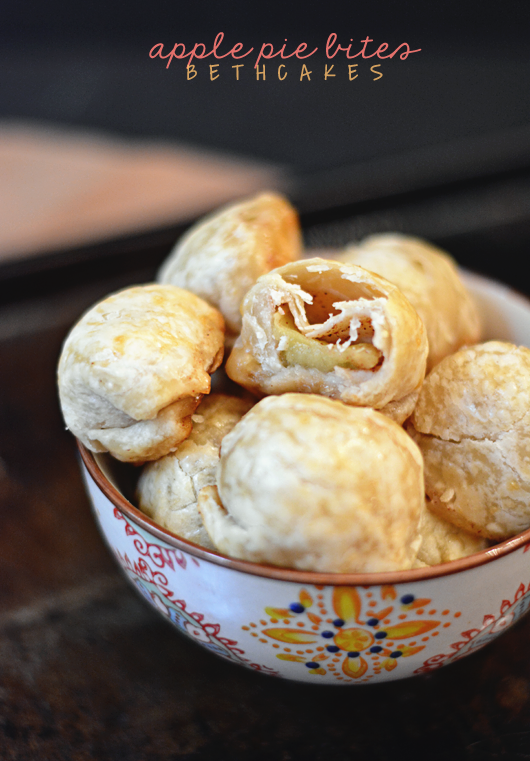 So I thought about little balls of apple rolled in a brown-sugar-cinnamon mixture, and then wrapped in pie dough. The only tricky thing is that you have to make sure the edges and creases of the pie dough are sealed up extremely well. If not, the dough will come open while they’re baking in the oven. Just press the edges together really well and use a small dab of water as an adhesive. Then I rolled the ball between my hands to make sure it still had a nice round shape. In a medium sauce pan, combine sugar, lemon juice and water. Without stirring, bring to a boil. 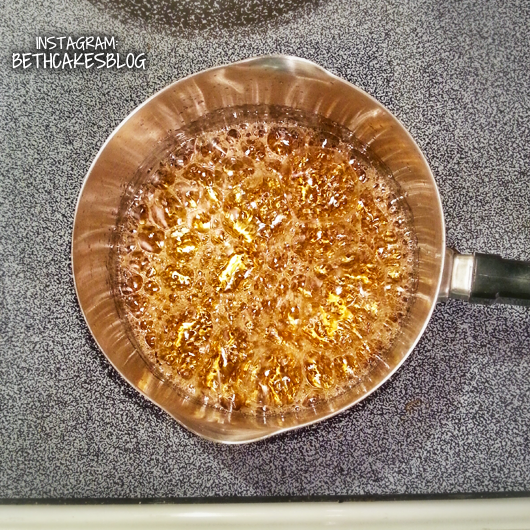 Let the sugar mixture continue to boil for 8 minutes, or until the color turns to brownish-amber. Occasionally, give the pot a swirl by holding the handle. (Don't stir!) Watch the pot carefully when the color begins to change because it could burn quickly. Remove from heat and add heavy cream, butter, and bourbon. Whisk until the butter is completely melted and the mixture has stopped bubbling, about one minute. Set aside to cool. Best if served slightly warm. Stir together granulated sugar, brown sugar and cinnamon in a bowl and set aside. On a clean surface, unroll one roll of pie dough. Using a circle 2 - 2 1/2 inch cookie cutter (I used a glass cup) press into dough. You should get about 8 or 9 circles. Gather the scraps, roll them out, and repeat. You should get 11 or 12 circles from one roll of dough. Next, peel half of one apple. That way, you'll be able to hold the apple on one side and scoop out of the other. Using the melon baller, scoop out one piece of apple. Roll it in the sugar-cinnamon mixture, and then place it in the middle of one circle of dough. Repeat with the rest of the dough and apple. Fold the dough around each ball of fruit, and make sure you press the seams together. At this point, the dough might be lumpy and not resemble a ball at all. If this is the case, roll it in a circular motion between your hands. Repeat with each circle of dough and ball of fruit. Then repeat with the second apple and second sheet of pie dough. Bake for 18-20 minutes, or until lightly golden brown and flaky. Transfer to a wire rack to cool. Best if served a little warm! 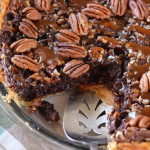 Bourbon Caramel Sauce adapted from Southern Living. Apple Pie Bites recipe from bethcakes. All images and content are copyright protected. Please do not use my images without permission. If you would like to republish this recipe, please re-write the recipe in your own words, or link back to this post for the recipe. Thank you. These little bites are adorable! 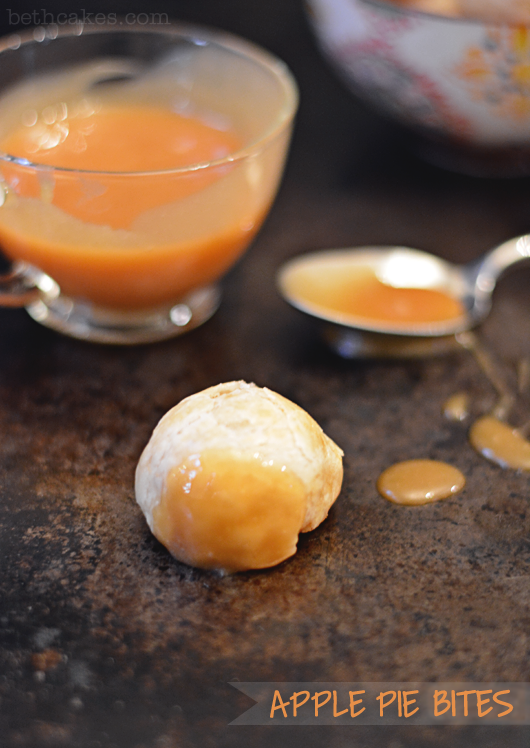 I love the sound of that bourbon caramel sauce – so good! I did a massive kitchen clean out before we moved – I was going nuts with how full all our cabinets were! Thanks Ashley! And yeah, I didn’t realize how much stuff I had until I had to move! Craziness. Thanks, Shashi! I didn’t think about them being super portable, but I guess they are! OMG BETH I NEED THESE RIGHT NOW!!!!!! Agh they are so tiny but so delicious I want to live off them all winter! Mmm, the caramel glaze just makes this! They look so light & fluffy too! I’ll take that bourbon caramel sauce on absolutely everything, thank you very much! I love these!!! Sharing on my FB soon! Oh gosh! Thanks so much, Julianne!! 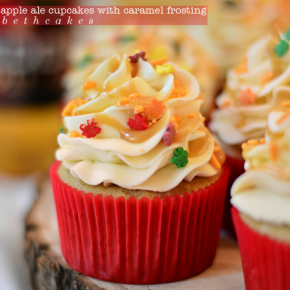 Apple pie is my all time favorite dessert so I know that these would spell trouble with me. I would probably eat the whole batch! 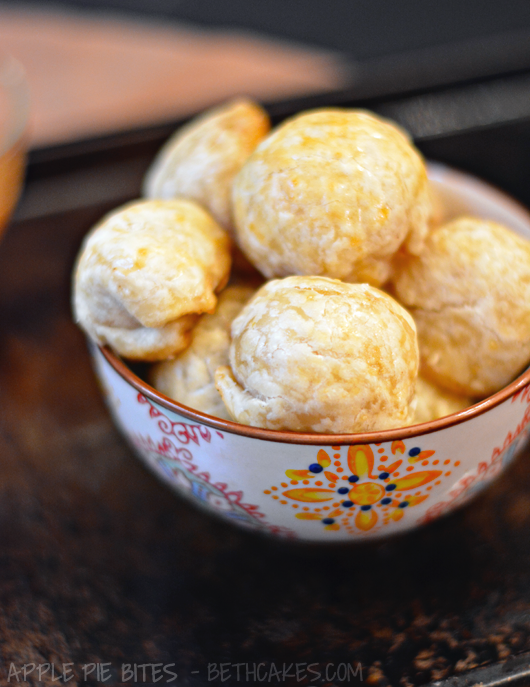 Thank you for sharing such a delicious recipe with us! I hope you have a good end to your week! Oh yeah, these were trouble for me too! Thanks for your sweet comment, Monet! 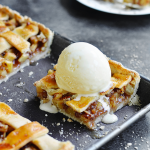 I love the idea of apple pie in bite size! Also love the idea of dipping! Yummy all around. These are so cute! And perfect for dinner parties! I also think they’d be adorable served on skewers–there’s no real way to go wrong with teensy pie bites. Beth! Oh my goodness, your photography looks gorgeous, and those bites look to DIE FOR. 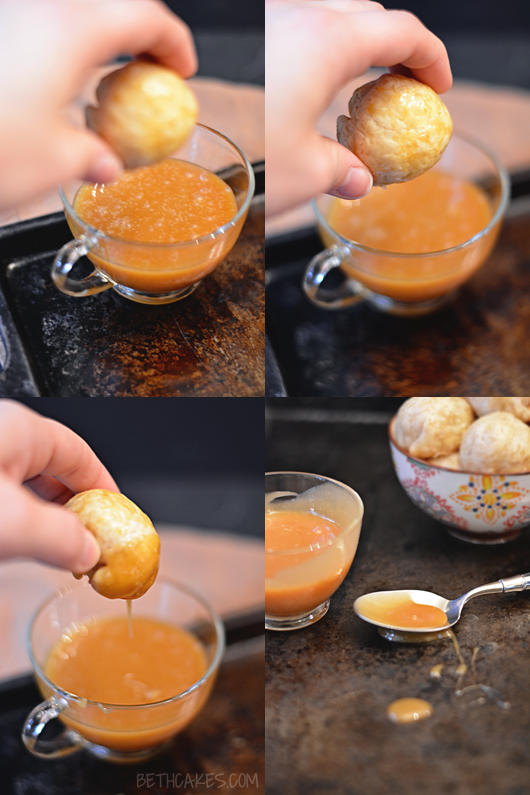 And dipping in that caramel sauce…omg. Can’t even deal. 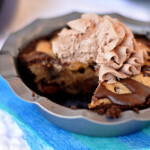 I need to make them, just so I can devour them all. YUM. 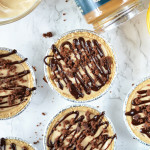 Love the idea of pie bites! What a great idea!! 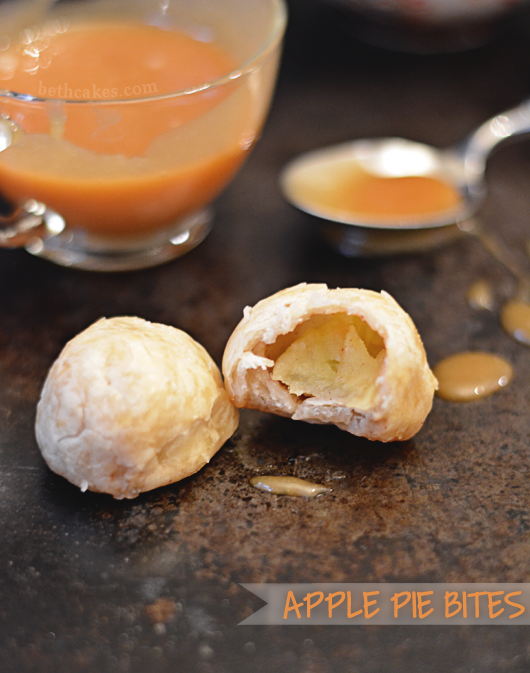 I love the thought of apple pie bites! I have much too much stuff as well. We have two apples trees in our yard and our harvest is ready to be picked. 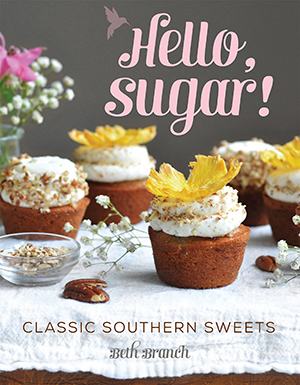 I am going to make these over the weekend. I think I’m going to use a powdered sugar glaze on half to see how they taste. Thanks for sharing! I didn’t see where the egg was used in the recipe?